What happens when landlords and tenants disagree? There are a lot of potential disagreements, and just as many potential resolutions. Whether the renter (tenant) is at fault, or landlord is being unreasonable, the law has a solution. In this article, we will talk about the most common landlord tenant issues and how they are resolved. Issues include: (1) unpaid rent, (2) housing defects, (3) withheld rental deposits, (4) problematic neighbors, (5) discrimination, and (6) lease disagreements. Not paying your rent is the surest way to get evicted. Simply put: unless you have very good reason, if you don’t pay your rent, you will get evicted. However, landlords can’t simply kick a renter out. They need to get permission from the courts to evict a person, and if the renter still doesn’t leave, then the landlord must get help from the police. In essence, the landlord sues the tenant and asks that court order the tenant to vacate. There are often short, jury-less trials held. This process is sometimes called an unlawful detainer. What Can I Do If My Rental Has a Problem with It? If you rental has a defective stairs, or a leaky roof, or mold, or even an infestation, you might be able to get your landlord to fix it. A landlord is required by law to provide habitable rental units to his or her renters no matter what. If an apartment or a rental home has major problems with it, the renter can leave and stop paying rent. They can also stick around and fix the issue, then try to get their money back from the landlord and sue if necessary. If you believe your rental is uninhabitable, contact an attorney or your local renters’ association. What Happens If My Landlord Withholds My Deposit? Rental deposits are a fact of life. Most landlords keep them so they can pay for any damage to the rental unit or unpaid rent after the renter moves out. However, there are often disputes as to what exactly is owed. If you believe your landlord has wrongfully withheld your deposit, you can explain yourself to your landlord, and if that doesn’t work, you can sue your landlord for the amount withheld. What Do I Do If Third Parties (i.e. neighbors) Are Causing Problems? All rental units come with something called the implied covenant of quiet enjoyment. This means that the renter should not have their rental unit unreasonably interfered with, whether by a loud bar next door, trespassing neighbors, or leaking sewage. The landlord must have caused the problem or been aware of it. If a renter is experiencing a problem, they must notify their landlord. If the landlord doesn’t fix it, the renter has grounds to move out within reasonable time. Again, if you think you have this problem, consult an attorney or your local renter’s association before taking action. What If My Landlord Discriminates Against Me? If your landlord discriminates against you, whether due to your race, age, religion, sexuality or disability, you might have grounds to sue. These cases are very complex. Consult an attorney or your local renter’s association before taking action. What If We Disagree Over Our Lease? Re-read your lease – You might find that you signed for a term that undermines your position. 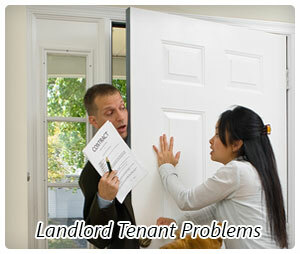 Talk to your landlord – Most issues can be easily resolved. Be nice. Be understanding. Get any agreement in writing, or amend your lease. Consult a professional – Call an attorney or your local renter’s association to try to get advice. They might be able to resolve the issue for you with little more than a letter. Turn to the courts – Whether you want money (damages) or you want your landlord to do or not do something (injunction), the courts are your way for getting it if you landlord refuses to work with you. Try to avoid disagreements with your landlord by thoroughly researching your landlord and your rental before signing the lease. Also, make sure to understand the terms of a rental lease before signing it.